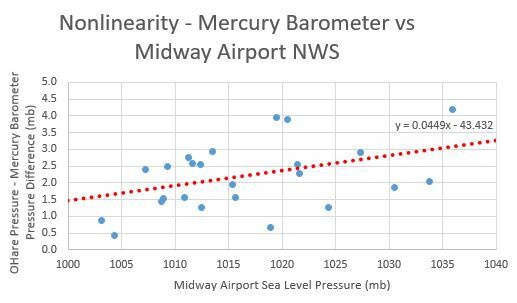 For the month of January 2017 I compared once-per-day sea level air pressure values from my mercury barometer with Natrional Weather Service (NWS) simultaneous reported values at the local Chicago airports. There are two airports near me. O'Hare Airport is about 22.7 km WNW of me, while Midway Airport is about 18.6 km SW. Both distances are straight line. The O'Hare barometer altitude is 673 feet above sea level, while the Midway barometer altitude is 623 feet above sea level. My barometer is about 720 feet above sea level, largely because I'm on the 14th floor of a high rise building. Midway was the official Chicago weather station until January, 1980 when it was moved to O'Hare. The difference could be due to mercury barometer reading error. The mercury in my barometer is rather oxidized, which makes the zero point adjustment a little difficult when taking readings. However I suspect that this error is within the scatter of data points around the trend line, and is not represented in the offset of the trend line itself. Another possibility is that some air has leaked into my mercury barometer over the years, it's quite old, resulting in lower readings. I live in a high rise building and usually have my windows closed, especially in December. There is a building exhaust system with vents in the kitchen and bathroom. The kitchen vent is normally closed, but the bathroom vent doesn't close. The average difference of 1.5 mb observed with the O'Hare data corresponds to 0.6 inches of water, which might correspond to the air pressure reduction due to the exhaust system. A fourth potential source of the difference is that my altitude is different from the two airports. Although all the data is corrected to sea level, the correction procedure might introduce a systematic error. This might explain why the O'Hare and Midway values average about 1 mb different from each other. Midway is at a lower altitude than either O'Hare or my location and has a higher pressure difference from my barometer. Finally, I'm about 0.5 km from Lake Michigan, a very large lake, while the two airports are much farther away from it. The air temperature in December is often 10 degrees F higher at my location than at O'Hare because the lake water doesn't get below 32 F. Also the humidity can be higher at my location, for obvious reasons. The downward slope of the O'Hare linear trend line is -0.025 mb/day. The downward slope of the Midway linear trend line is 0.034 mb/day. Both are minor and probably represent random trends in mercury barometer reading errors. 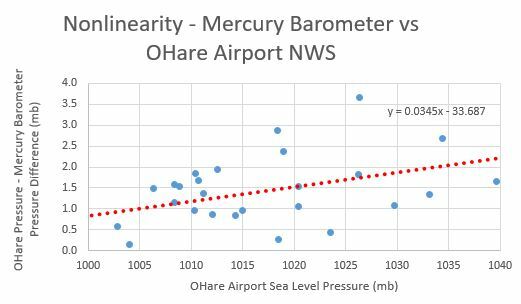 The average upward slope to the linear trend line for the O'Hare data is 0.0345 mb per mb barometric pressure. The average slope for the Midway comparison is 0.0449 mb per mb barometric pressure. Both are minor and probably represent random trends in mercury barometer reading errors.